RSS feeds can include headlines, short descriptions of the feed, and other information. Locate the RSS feed you wish to include. Your feeds will be listed alphabetically by the title of the feed which has been provided by the feed itself. The list will also include the feed provider’s description. Select the records you wish to import by clicking on the appropriate checkboxes. Select a folder to import your records to in the Put in Folder drop-down. After the import you will be taken to the Import view in RefWorks. (or whatever you are using for this page). Click on View Last Imported to see the feeds. 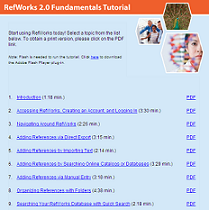 View the RefWorks help screens on incorporating RSS Feeds.